Last week I needed two cards to include in some swap packages for a stitching group I’m in. Even though I am busy with work, slogging my way through the Manuscript That Never Ends at a lightning-quick rate of three pages an hour, I couldn’t bring myself to use store-bought cards. It’s the peer pressure, you know. The stitchers in this group are so talented—and not just at needlework. Some of the cards I’ve received have been amazing. I couldn’t send a mass-market card, now, could I? The shame! 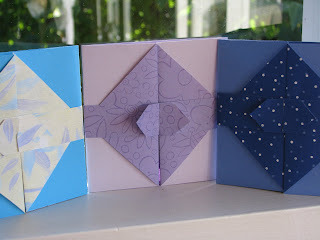 I braved the mess in the craft room to look through some books and decided to make these origami cards from Klutz’s Handmade Cards (yes, I realize that Klutz kits are meant for kids, but this klutzy adult has been known to buy them for herself). While I was at it, I made one for the senior I write to through Senior Angels, since over the years he’s seen every note card I have in my extremely large stationery collection. 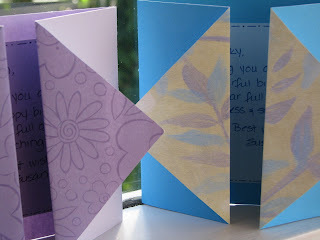 Although these cards are simple and not nearly as impressive as the ones I’ve received, they were quick, easy, used stuff I had on hand, and turned out well enough that I wasn’t ashamed to send them. And when I’m old and gray and finally finished with the Manuscript That Never Ends (I know it doesn’t make sense to be finished with something that never ends, but after several intense hours of sloooow editing of someone else’s writing today, I’m not too picky about my own), maybe I’ll finally find the time to get some stitching done. Wow. Not only did those turn out great, but even great enough to post a picture. They look terrific. Way to go. And you used what you had. Imagine that. See? That is why you must buy craft supplies when you can. Cool cards. I'm all thumbs to this type of thing; but always enjoy looking at them. Ok, it's official...you've not been around long enough I'm wondering if you're ok? Sure hope so. Just letting you know you are in my thoughts. Leaving you a hug.